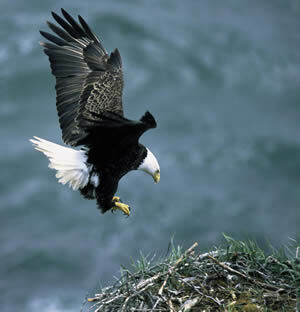 Featured Favorite Bird - Bald Eagle, Learn all about Bald Eagles. ■ The national emblem of the United States, the Bald Eagle was threatened with extinction in the lower 48 states because of DDT (a type of pesticide) poisoning. ■ Humans are the most important source of mortality for this threatened species. ■ Bald Eagles occasionally hunt together. One flushes prey towards another. ■ Bald Eagles prefer fish, but they also eat large birds, mammals and carrion. ■ Clutch size is 1-3 eggs. Egg description is dull white, usually without markings.